We were fortunate to have the opportunity to exhibit twice in the Twin Cities over as many days. 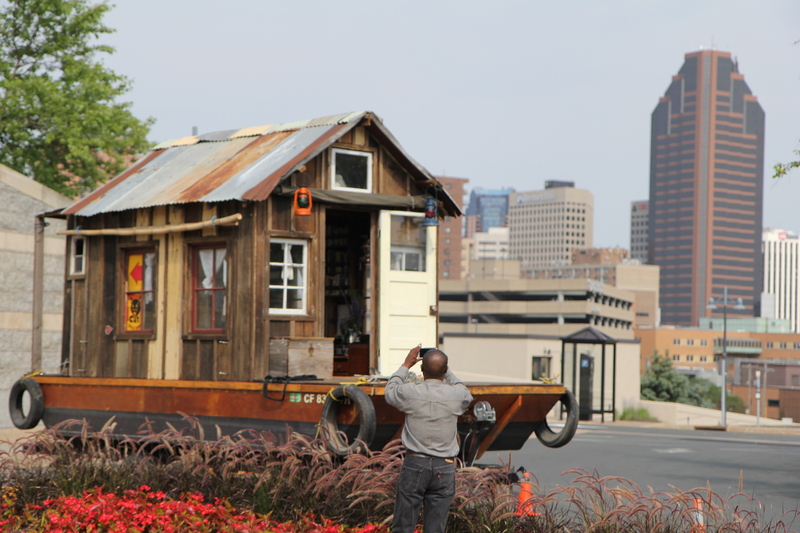 One was at the Minnesota History Center as part of Nine Nights of Music. 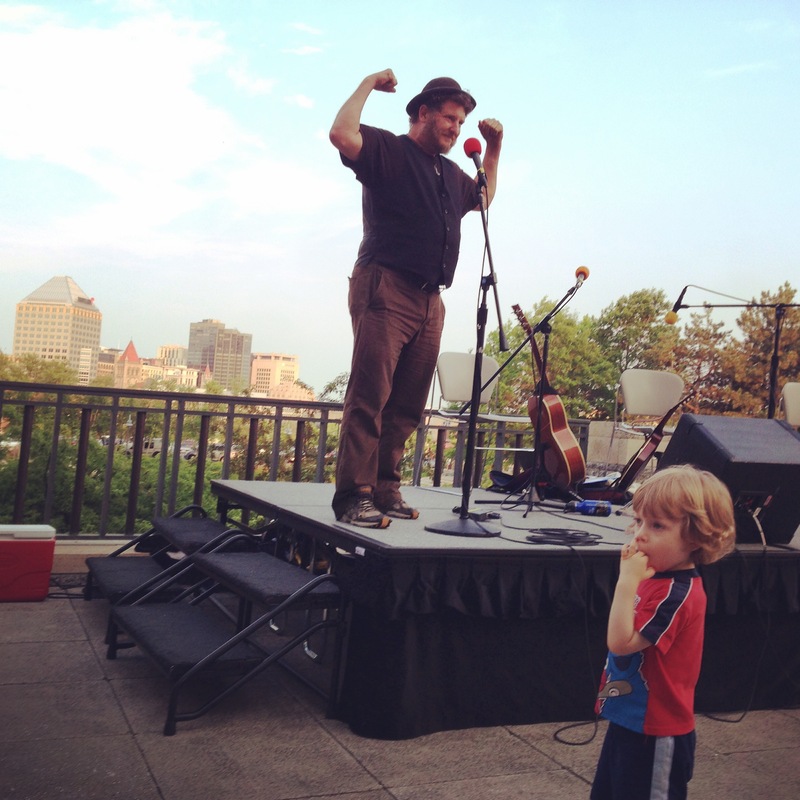 The other was at the St. Paul Yacht Club as part of a River City Revue. 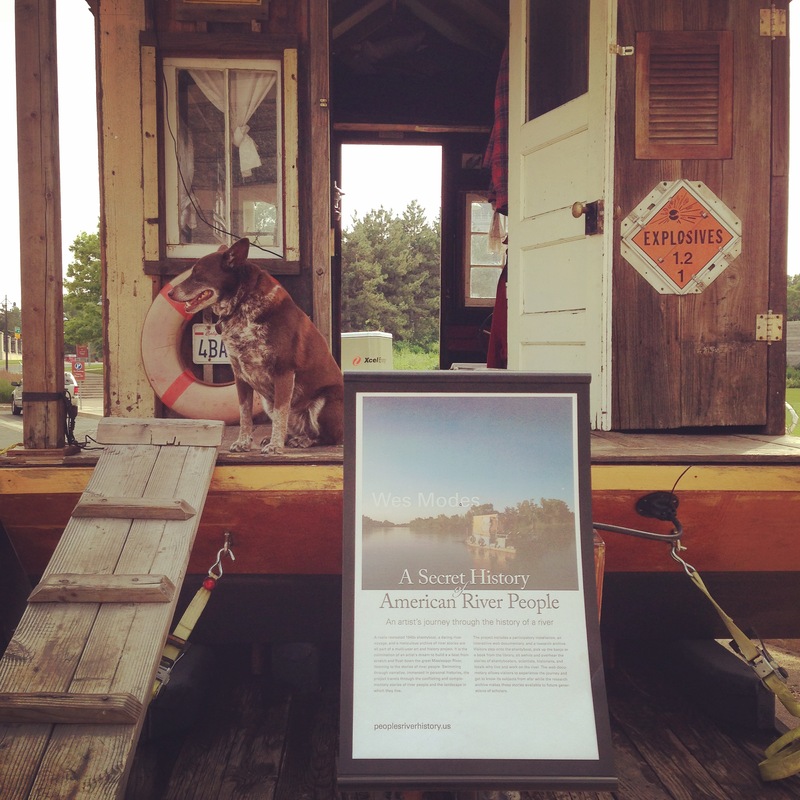 Both were co-sponsored by the National Park Service and the Mississippi River Fund. Nine Nights of Music is a free public music event held on consecutive Tuesdays throughout the summer at the History Center. There is music and dancing and art. We were honored to kick off the first of the series. The History Center still amazes us. It is like an enormous temple to the past in an alternative universe America where society cares about art and history — which, come to think of it, might describe Minnesota. The Minnesota History Center has rotating exhibits and permanent exhibits, many on a huge scale. In California, the historical society is usually a couple of old lady volunteers with a few shoeboxes of photos. Wendy Freshman from the History Center and Dan Dressler from the National Park Service (in full uniform) were amazing MCs. 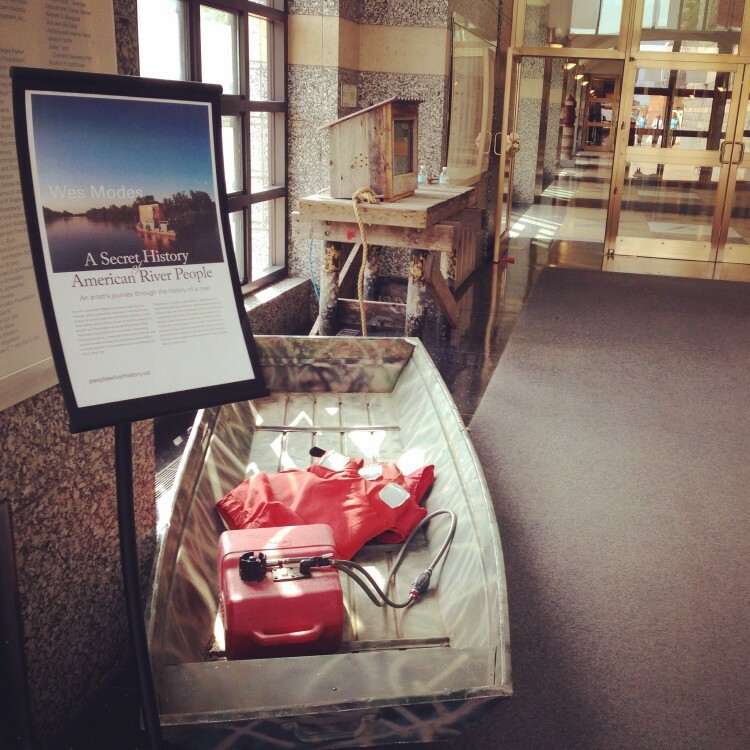 We had the installation in the entrance of the History Center. A small weathered pier moors the shantyboat to the rest of the installation, which includes a 10-foot johnboat roped to the pier. Inside the johnboat are items associated with a small boat: a gas can for an outboard motor, a few life jackets, and two oars. 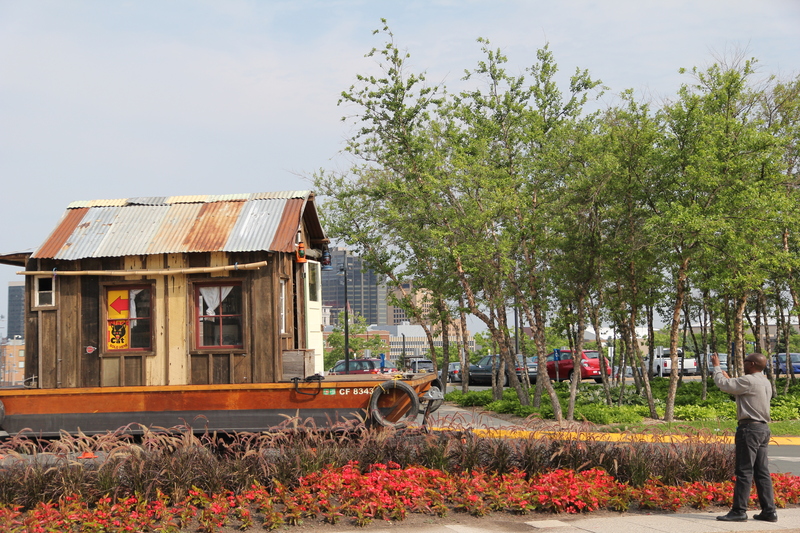 Atop the pier is a small tin-roofed hutch, which serves as a display kiosk for an interactive documentary. In the front is a touchscreen monitor upon which the documentary is exhibited. 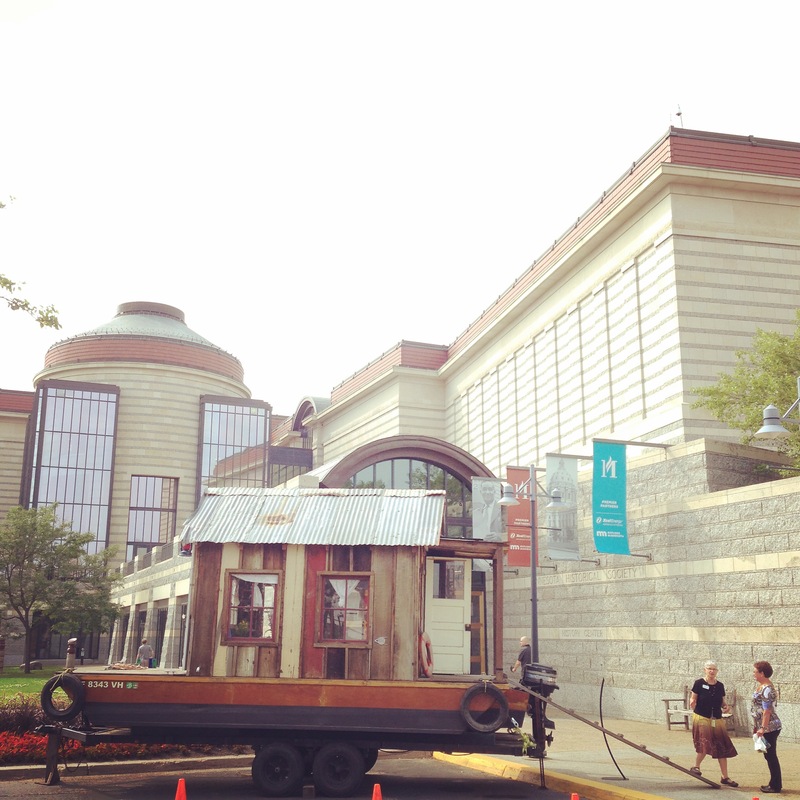 The shantyboat was positioned at the entrance to the History Center just outside. 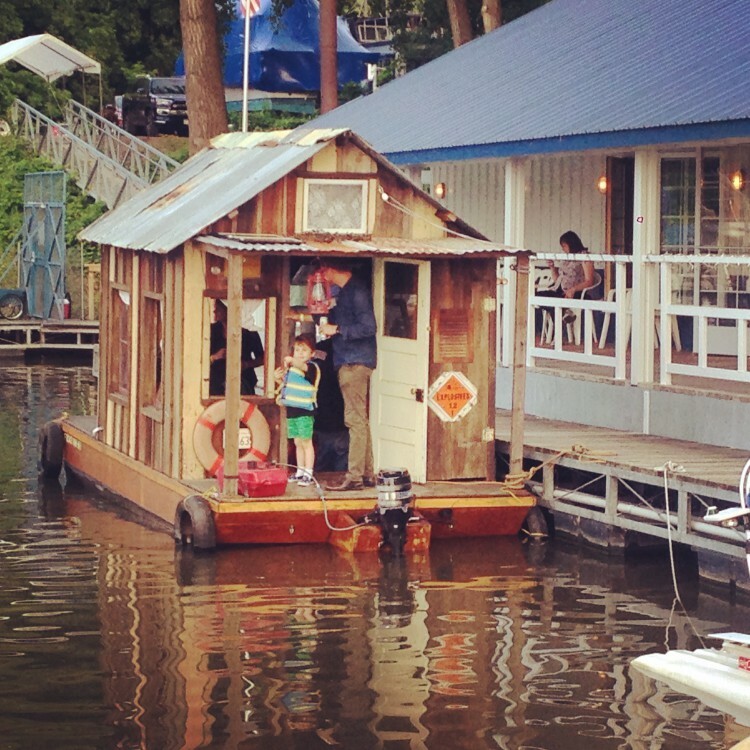 It was a huge success with people lined up to visit the boat. We answered questions nearly constantly from the start to the end of the event. Nearly a hundred people signed the ship’s log and a few wrote their stories for the archive. I gave a brief talk introducing the project to the crowd of 600 which was well-received. In the crowd was Lauren Donovan who we interviewed during last year’s fieldwork. See excerpts of the interview here. 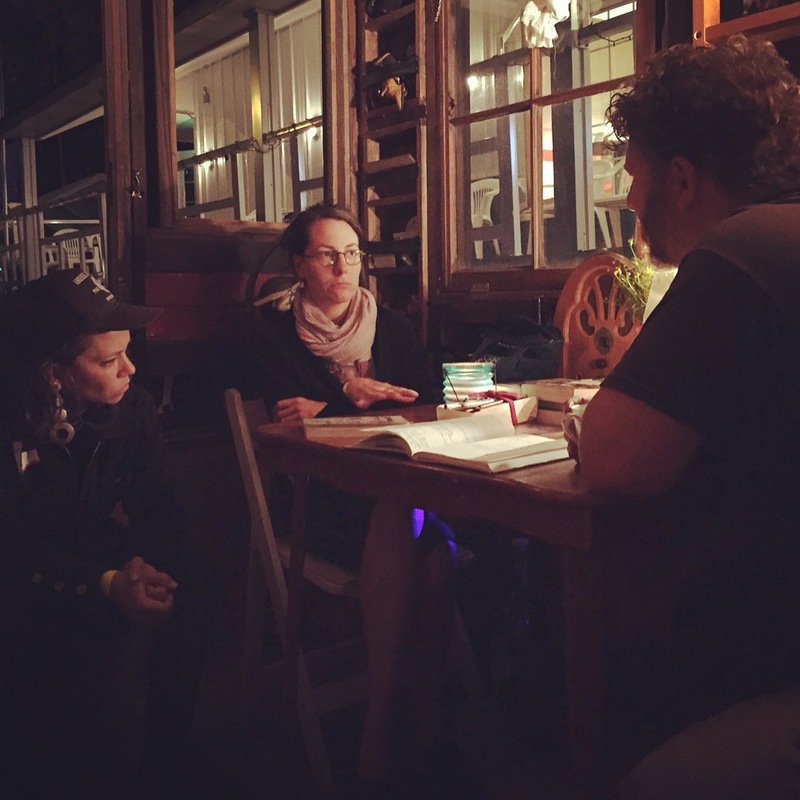 After the event, we hung out exhausted in the shantyboat in the History Center parking lot drinking bourbon. Folks from the band came down to see us and serenaded us on our own banjo. We learned that whenever anyone says, “Is that a banjo?” you just hand them the banjo and soon you will be enjoying music. We even got some decent press about the exhibition. THE NEXT NIGHT we had the event at the St Paul Yacht Club. 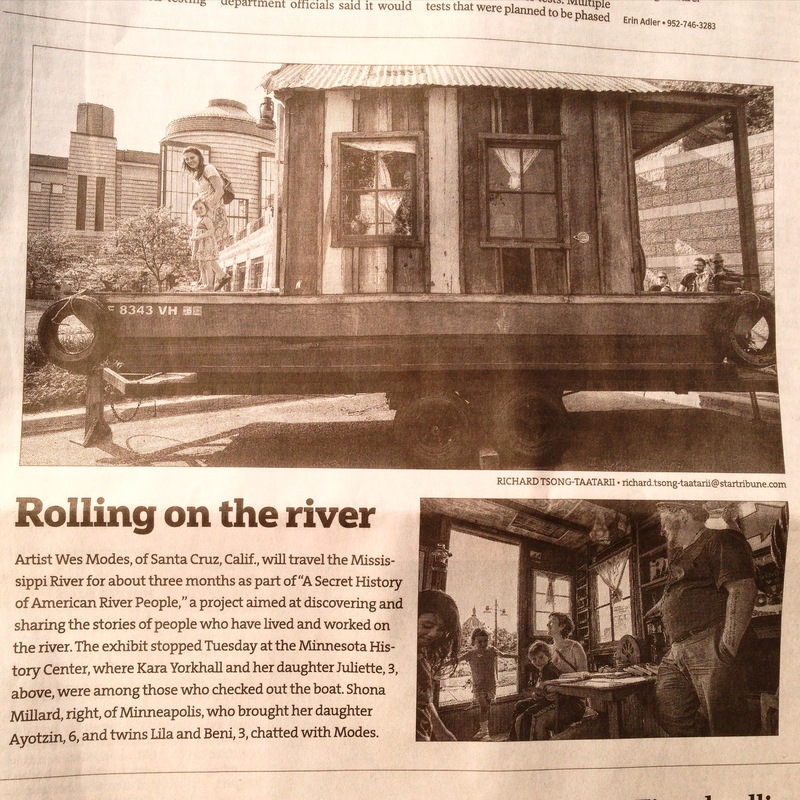 This was a River City Revue event put together by our friends at Works Progress. 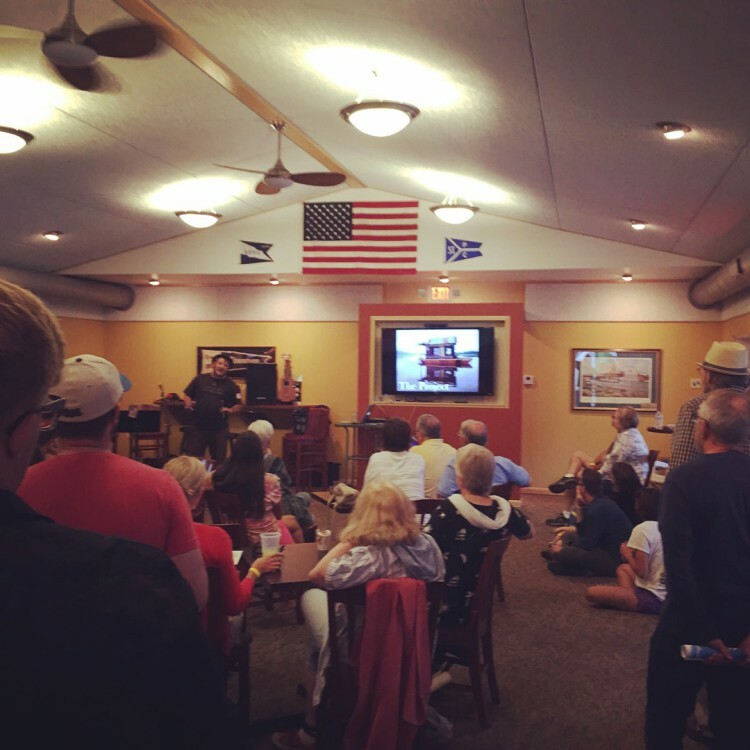 We were docked at the clubhouse, where food was served and and music from the Yacht Club band was playing. Yacht Club members were giving tours of the boats in the upper marina. Meanwhile, a steady stream of people toured the shantyboat. I was invited to give a 10 minute talk about the Secret History project and the house was packed. During the exhibition Lauren taught Rachel how to hoot. We schmoozed and drank White Russians. People signed the ships log and left dozens of river stories. Liz from the previous night’s band and Sara Peters of Norther Spark came to visit us and hang out. 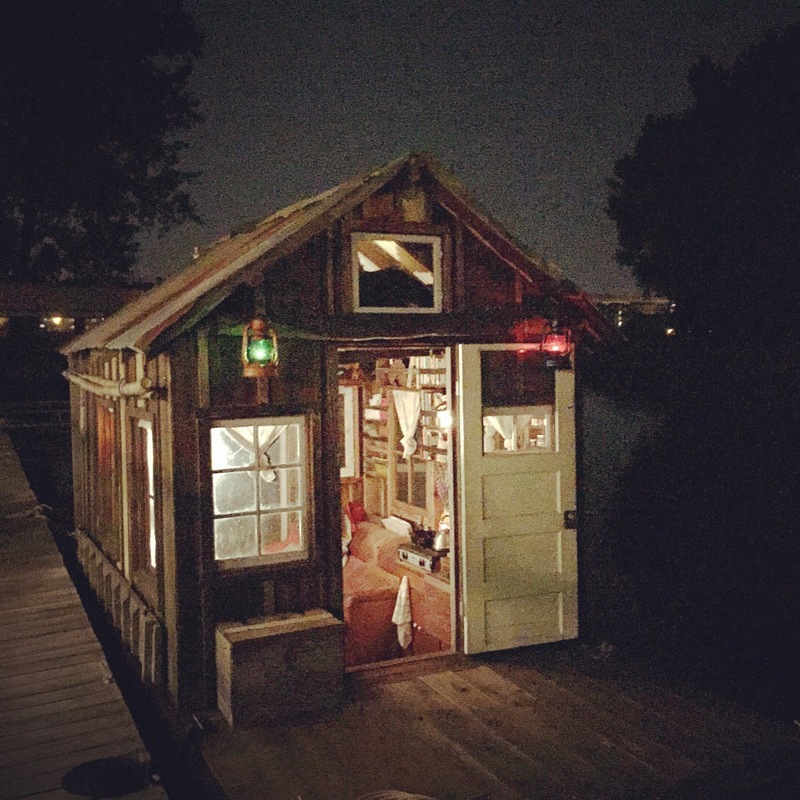 The shantyboat looked dashing and sparkly, modeling its new oil lantern navigational lights. 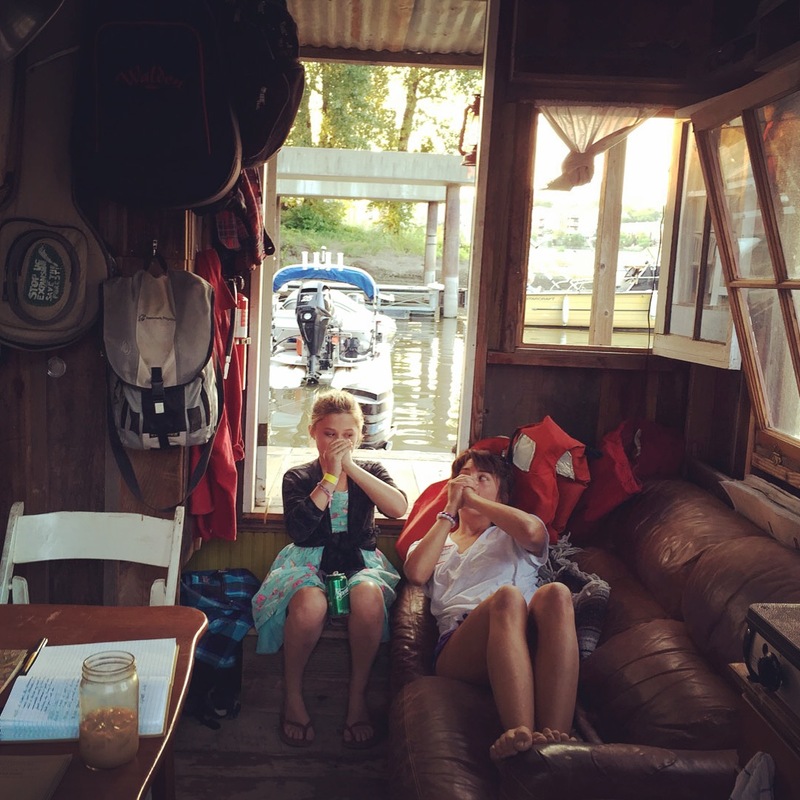 The next day we were up and out of the water, off to our next launch at Winona Minnesota.